and how we can help you realize your dream Artificial Grass garden. 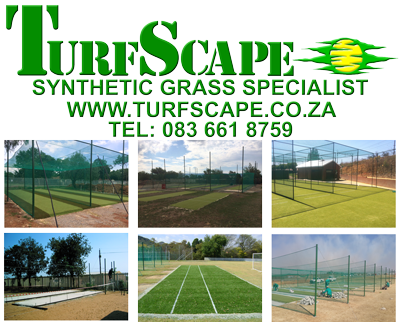 Being one of the FIRST Synthetic Grass companies in South Africa, We never take our role as market leader for granted. Instead, we constantly innovate and improve our services, methods and products to remain number one. 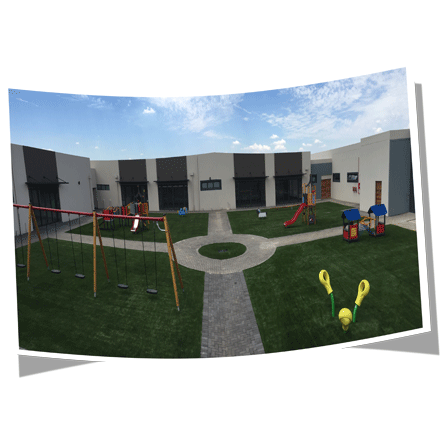 Our strong service portfolio consists of really exquisite Synthetic Grass installations and a gorgeous Artificial Grass product range that cuts across the complete Synthetic Grass industry in South Africa. We know each client is unique, so fully understanding every client we partner with, ensures a customized installation plan designed to achieve their specific goals/dream at the minimum cost. Our mantra for success is single-fold customer satisfaction, if not delight. We not only strive to deliver further, better and quicker; but also listen actively to feedback we receive from our customers to try and enhance our service delivery experience. 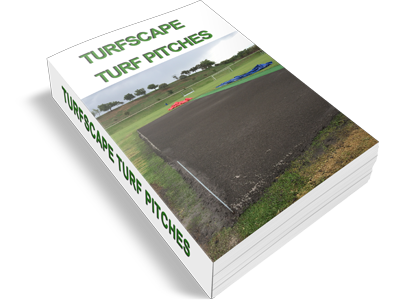 We at Turfscape believe that quality must be measureable, it must be represented in our product range and workmanship, because that is essential/vital for us to earn your trust. 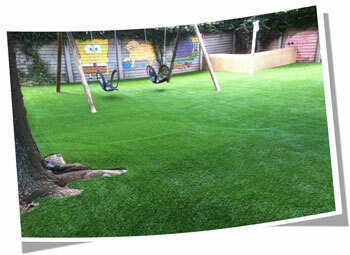 Our famous Synscape™ Artificial Grass range carries an 8 year warrantee. 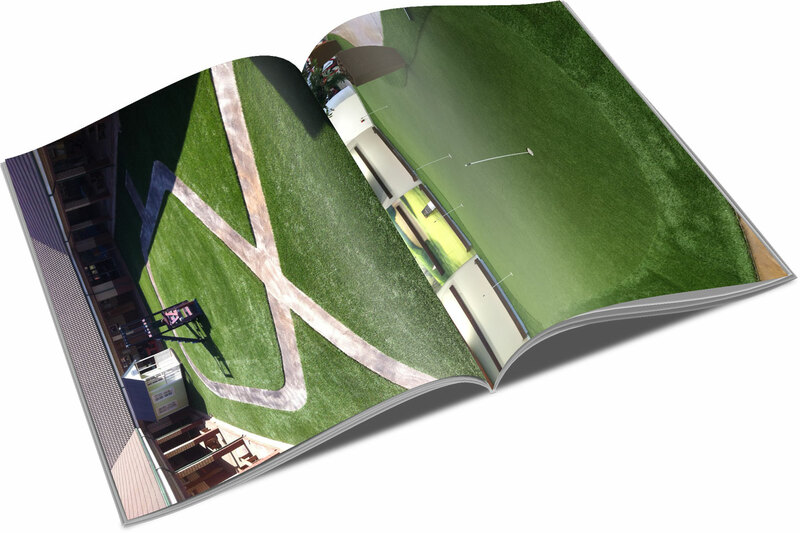 C-Shaped Synthetic Grass yields much more resistance to flatness and much less maintenance. Double layer backing on Artificial Grass lends itself to a much more durable product. The difference between Ordinary and Extraordinary is that little Extra and that is what we offer all our clients. 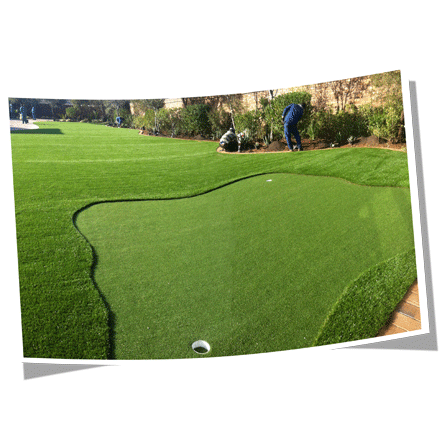 Turfscape's Artificial Grass products is used in all Pro-Shops throughout South Africa. 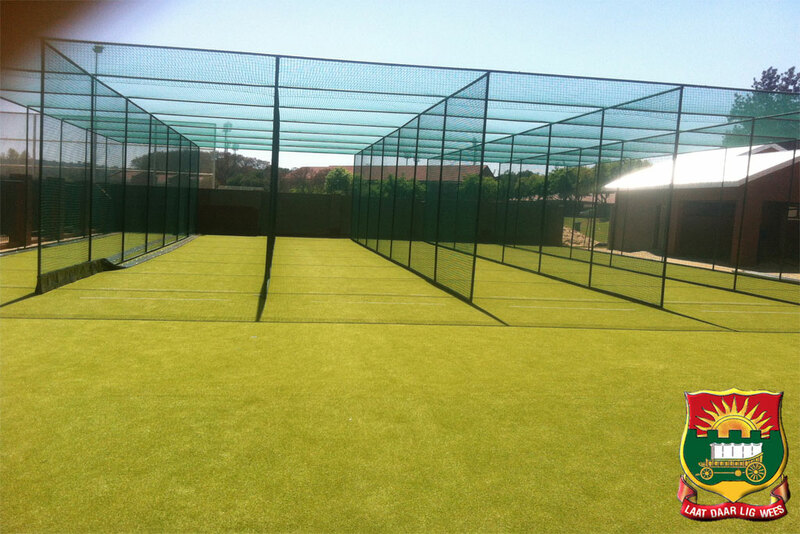 Synthetic Cricket Grass and Cricket Nets at Afrikaans Hoërskool Pretoria was done by Turfscape. Our skills in Artificial Grass installations and our reliability to deliver high quality end products, is what sets us apart from others. 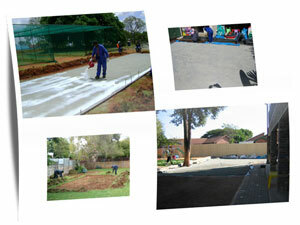 For over 25 years we have been servicing our clients in Gauteng Area. We honour our commitment to our valued customers who choose to come to us for not only our exquisite range of products, but also our professional expertise. to create our edge of excellence and to ensure that our end result meets and exceeds the expectations of our clients. We use a systematic approach on all our projects and is managed in-house from start to finish. and will be confered to the client at all times right through the project as-or-when deemed necessary Because we are leaders in the Synthetic Grass industry, we display our integrity by using facts to support our products and services. We create an environment for positive change built on collaboration and trust. 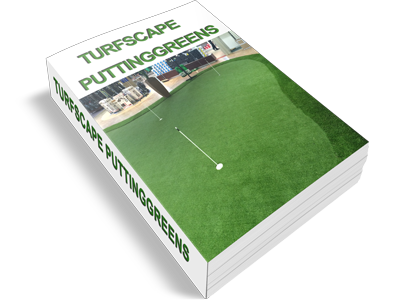 Turfscape generates customer satisfaction by exceeding expectations through creativity, innovation and teamwork. Through this, we have developed solid relationships with all our clients over the years. We constantly monitor and evaluate new products and propose the best solution to fit your budget and schedule. 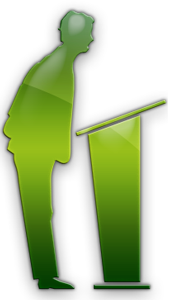 to whom all of Turfscape is committed to deliver exceptional service and value. Simply put, we listen and understand your needs regarding your project. Close collaboration with many companies, home owners, schools, clubs and practices like yours has given us valuable expertise that readily translates into a key area of trust. Leveraging our knowledge of your project, we’re able to create world-class solutions that incorporate the latest technologies used in the synthetic grass industry. There’s tremendous value in providing quality Synthetic grass products, that match your needs at a cost effective price and functions the way you intended. To complement that powerful portfolio, we provide a variety of products, services and support offerings that tap into the experience base of our team..
Over time, with our high quality synthetic grass products and innovative ways to provide best solutions, Turfscape began to build a reputation for delivering the high quality projects. You become known by your client base. These relationships were founded on a genuine interest in creating win-win scenario between our clients and us. We’d be honoured to apply our experience, solutions and results on your behalf and start to gain your trust. Removed old debris, level area, construct the base, and install putting green with fringes. Completely removed all Kikuyu grass, level the area, install 689m² Synscape Lux and construct a puttinggreen. 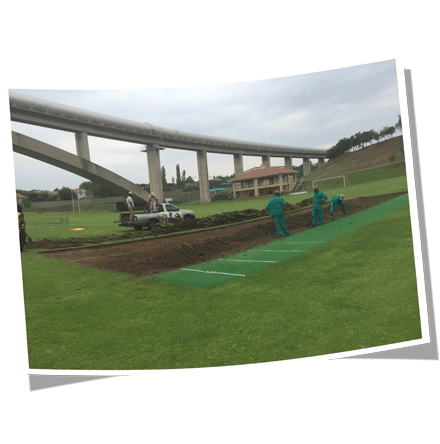 Construct a complete new Cricket pitch at Dainfern College. Cricket pitch constructed with our own Cricket Clay(Bulli) source. Synthetic Grass is NOT completely maintenance free. You need to occasionaly brush it up with a hard bristle broom to prevent it from going totally flat. Even more so with a Flat Blade type yarn. - How do Animals (Dogs) behave with Synthetic grass? 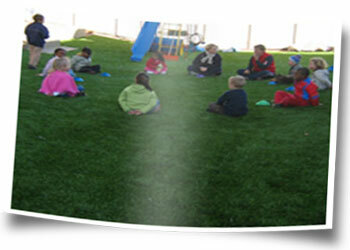 - How do I choose the correct Artificial Grass for my Playground? Our service motto is based on these three pillars:- Excellence, Experience & Integrity. 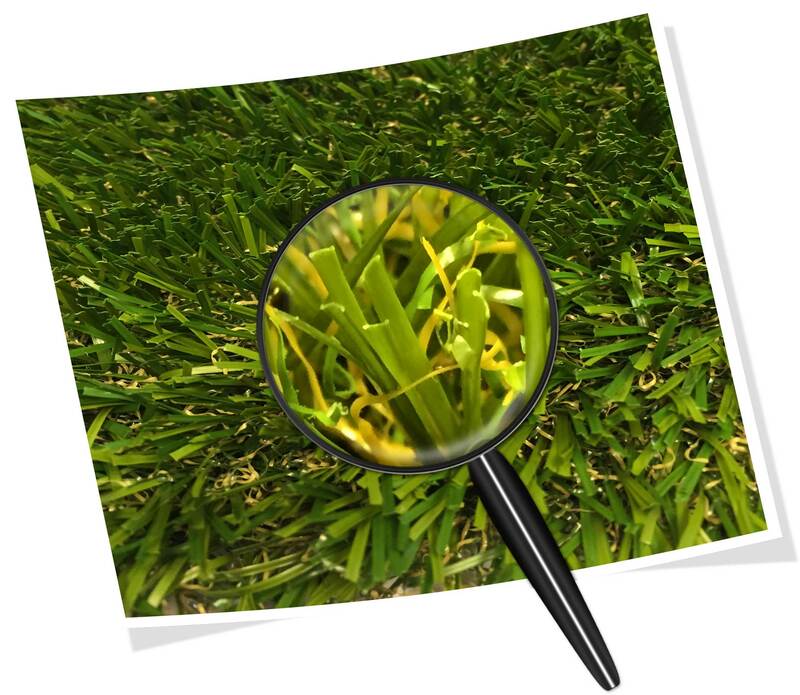 we act as a trusted advisor to our clients, helping them devise strategies and ideas to enhance the value of their Synthetic Grass investment. We design, construct and supply sport/practice facilities with synthetic grass for golf putting greens, landscaping projects, residential court yards, commercial applications, playgrounds, and more. 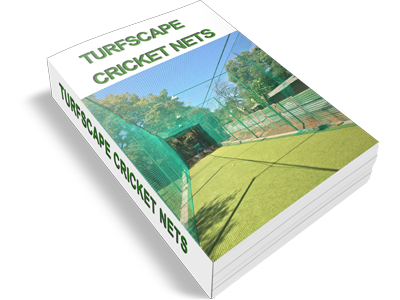 We build Turf Cricket pitches, Construct Practise Cricket Nets and Synthetic Cricket pitches for schools, clubs and residential, and only make use of our own very high quality inhouse cricket clay(bulli). Construction of a 5-A-Side Soccer pitch with a 40mm infill-type Synthetic Sports Turf. Due to our stringent installation programmes, Please allow us 24 hours to get back to you. in our products and/or services. Please allow us 24hours for feedback. Look no further than the Synscape™ range artificial lawn. 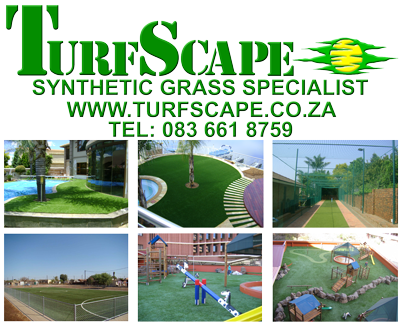 Most artificial grass distributors in South Africa sell the same ranges of the same grass types at the same prices. 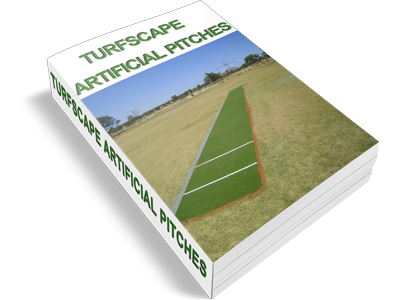 Very few synthetic grass retailers sells our Synscape product range. That is why we call it our flagship product as it directly reflects our quality, standard and leadership in the synthetic grass industry in South Africa. Our Synscape range is specially imported for its aesthetic value as a grass substitute for lawns. 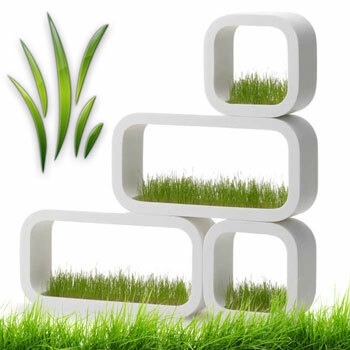 The height and density of the grass are carefully matched to provide the ultimate natural looking kikuyu grass effect. The Synscape™ range is a ravishing artificial grass that can be installed at any location, whether in the shade or in sunny areas, very soft and yet, extremely strong and durable. Synscape™ has become very popular the past year for areas such as around your swimming pool or Jacuzzi, garden, balconies, playgrounds, children rooms, restaurants, landscaping, etc. Our Synscape™ artificial Lawn is guaranteed to add that extra touch of luxury, of class, of enjoyment to your preferred area. The fibers is made of high-quality polyethylene that will retains its realistic Kikuyu green color and texture, year after year. The grass fibers are UV protected, hence our 8-year warranty on color fastness. 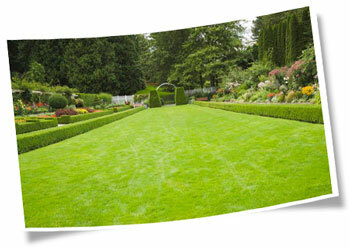 Synscape artificial Lawn is a safe investment for many years. 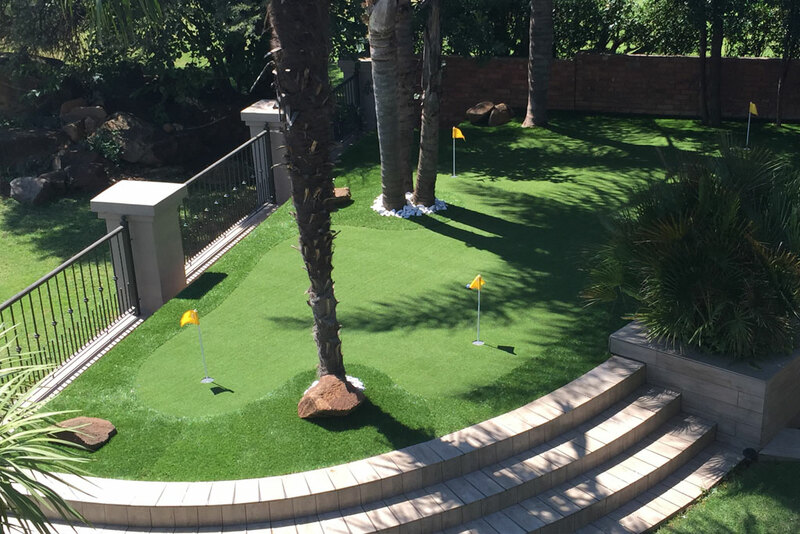 We have made huge changes to our Synscape range both in terms of the fibre structures and the backing, making this range now not only the most realistic looking artificial grass in South Africa, but also the strongest and most advanced product. 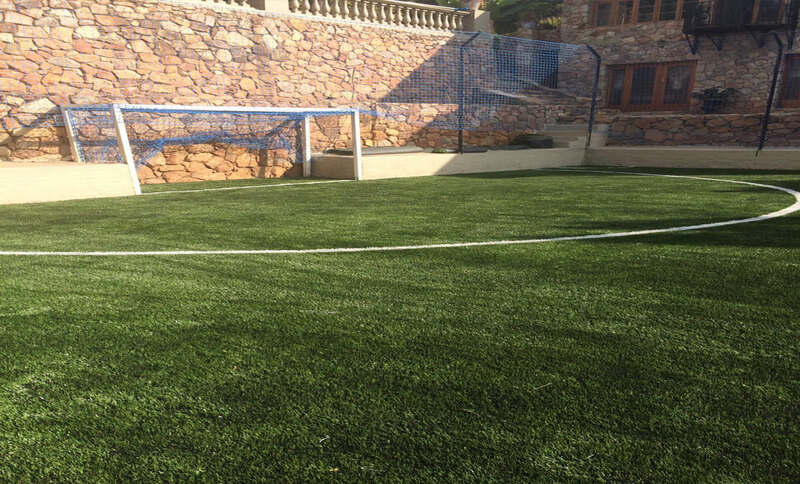 Synscape is the only Artificial grass currently in South Africa that introduced the double mesh backing, making this Synthetic grass the most strongest grass and best value for money in the country. We have also changed the blade of the Synscape range to a C-shape making this grass less prune to going flat within a week. This means much less maintenance and you only need to brush this grass up once a month if needed. Because of this (C-shaped blade), the Synscape does feel a little more harder to the touch than most other flatblade grass types available. With the introduction of the new Synscape Prestige, we once again have changed the blade shape to an S-shape, which now still have all the positive advantages of the Synscape Range, but is much softer to the touch. The Prestige is also a touch greener than the other Synscape ranges. We provide Synscape in three different pile heights, 20mm, 30mm and 35mm. Please note that prices may change without prior notice. Contact us for the latest prices. 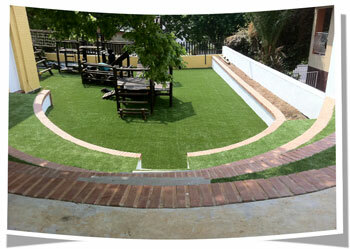 Please NOTE our Artificial grass is priced per m² and is sold per linear meter. When deciding on installing Synthetic grass, the first thing to think about is long term investment. The grass should last you a very long time. It is an expensive exercise, even more so if you cannot DIY your project. BUT... you don't have to pay extraordinary prices for Synthetic grass. Do consider cheaper artificial grass options. Sales people will tell you to stay away from imported grass for many reasons. There is no need to follow that advice. Many importers will give you a better product for half the price and the same warrantee that anybody offers you. Depending on the intended use, there are several options in various price ranges from which to choose. If aesthetic value is of lesser importance, choose a budget-friendly alternative. (It should be a tuff, hard, robust backing, and not a soft rubbery backing). There are many varieties of synthetic grass types now available, and to choose the correct type, is becoming increasingly difficult. 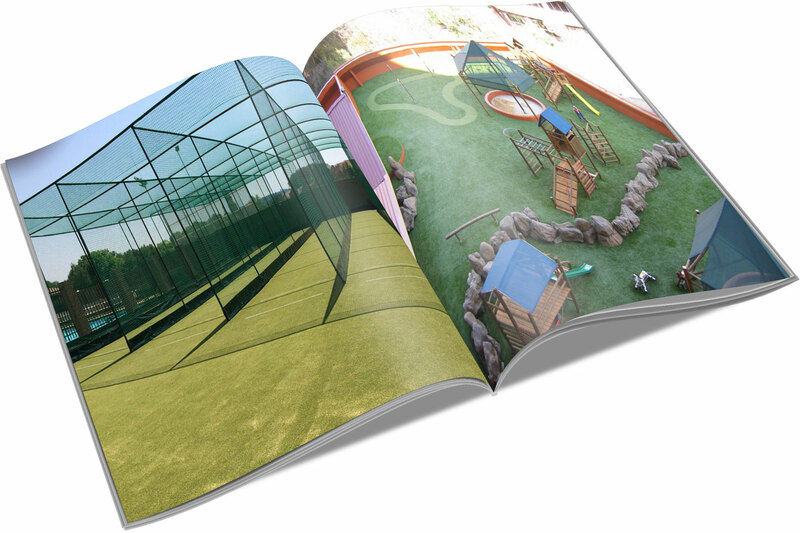 The first step is to decide which type of artificial grass is most suitable for the specific situation or project. You should base your decision on the nature of the usage, as well as your personal preferences in terms of color combinations and softness. The best way to get a good feel of the product is to physically compare samples, touch, walk, feel, test backing, etc. go for midrange pile height, garden, pool areas, go for a longer, softer pile height, etc. 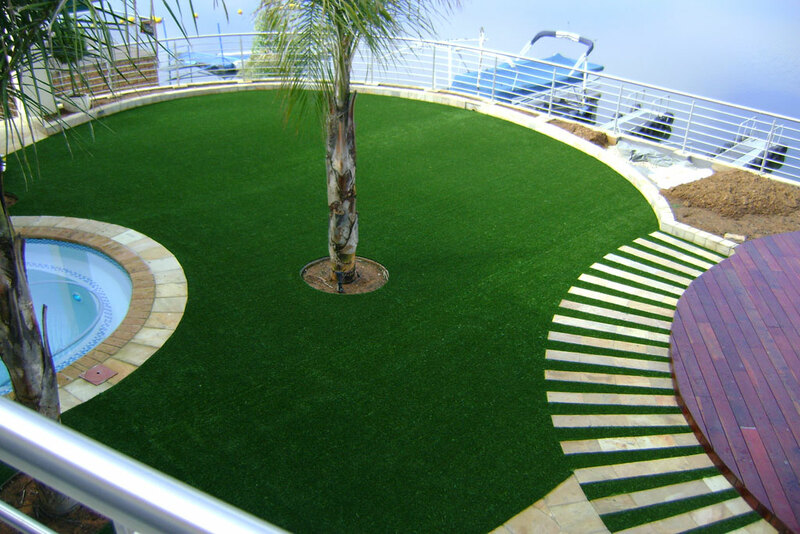 The price of artificial grass can vary tremendously. Inexpensive artificial turf does not necessarily have to be of poor quality, nor is expensive turf always of high quality. Pay close attention to the quality characteristics of the various suppliers. Purpose of installation. What is the grass main purpose and what is it going to be used for. Should it be an infill or a non-infill product. Some grass types need to have an infill to fully justify its looks. It might also be that the infill is part of the warrantee process. i.e. grass around a pool or grass on a steep slope. Guaranteed the infill will land in your pool, or will be washed away with heavy rains if installed on a too steep of a slope. Don't take the first synthetic grass sample shown to you. A good idea is to get samples of the grass types you're interested in, and then base your decision on what you see and feel. Remember, this should be a long term investment decision, and there is a big difference between synthetic grass, and fake grass. Always compare prices of Artificial grass products be the pile height of the grass. If you were quoted on a 30mm or 35mm, make sure your comparison quotes is also based on the same pile height or better. Animals (Dogs) vs Synthetic grass? 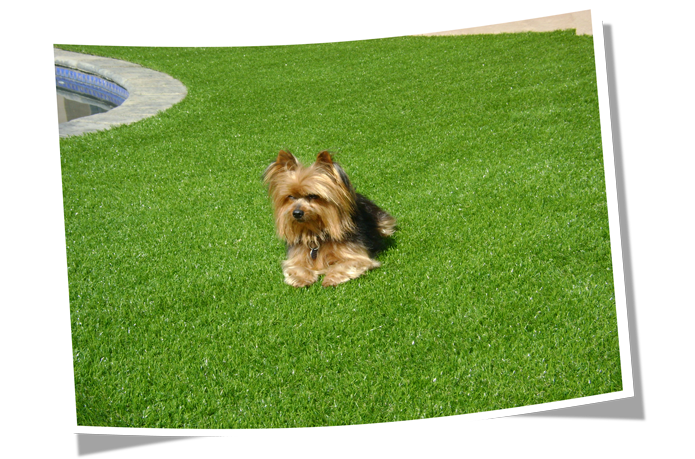 Artificial grass is pet proof and very pet friendly. Really? That's what everybody will tell you? Seriously? Do you have dogs? No problem at all. Pets just love artificial grass, and will not destroy or rip it apart. In fact, they find it so cosey in wintertime, because of the heat and it will become their spot to relax in the winter sun. So, if that is what is meant by pet friendly grass, then YES!!! it's true. BUT, if you think of pet friendly grass as in the dog can pee/poo on it as on normal kikuyu grass, you in for a BIGGGG surprise. The BIGGER the dog, the BIGGER the bladder, the BIGGER the problem. 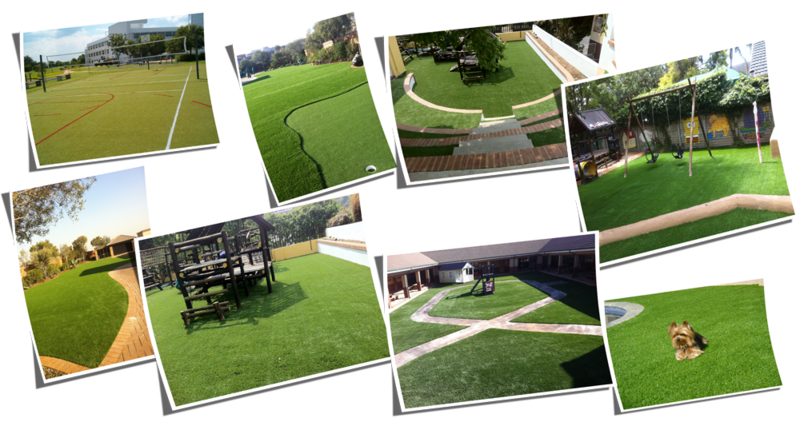 The ONLY pet friendly grass in South Africa is our Petscape. Why? There is a huge difference in the type of backing that is used. Have a look at our product range, and familiarize yourself with the difference of backing types. You WILL regret laying normal artificial grass in your garden if you do have dogs, guaranteed, within a month. So Don't believe that story again for one moment. Dogs needs to eat real grass for their metabolism. So yes they will try to eat the synthetic grass, but they learn quick. Dogs need a place to bury their personal belongings, ye, sometimes the owner's. So they need a place to dig. If you cover all your yard with synthetic grass, you might have a problem, but then again, dogs learn quick. An Installer worth his money will be able to work around the sprayers, and keep them functional at all times. Use the sprayers as normal, skip a day or two, and you will soon notice it. Visually and non-visually( through your nose). Thats why a good, well constructed drainage base is imperitive underneath the Artificial Grass (Petscape) to absorb the continious watering/cleaning process. If it does start to smell, then old story of vinegar and water does work to an extent, but it's going to be repeated for a couple of days. A dilution of normal pinegel mixed with water, leave it for an hour, and then rinse it well, does do the trick. Do not just trust all these so called "Artificial Grass Dog cleaning misteriously vaninsing products" that is becoming very popular on the market. We have tested several pruducts, and it DOES NOT WORK. I do not say DON'T TRY IT, All I'm saying is it does not work for my dog!!! The most important element of constructing a synthetic grass facility is the sub base preparation. Inadequate backfill materials-, compaction and insufficient drainage is a recipe for failure to any installation and/or construction project. Depending on the size of the facility and type of sport, it is important to consult with professionals in the civil- and geo engineering fields for their professional advice and support. Although expensive, geotechnical tests are recommended for all proposed large sport field facilities i.e. soccer fields. Drainage considerations for large sport fields are very important. The biggest cause in the deterioration of synthetic pitches is the presence of standing water around- or beneath the pitch. Generally, in the case of a non water permeable pitch, the surface water and the water that drain through the perforated backing of the artificial grass will follow the slope to the lowest areas of a the base. This water needs to be let into an outlet and carried away from the pitch area. Drainage requirements for a water permeable base needs additional sub surface drains to collect the water that seeps through to the sub base. The base is usually leveled with a slope between 0.8 - 1%. The location and surroundings of the proposed site and the water outlet locations are important factors in the design of a drainage system. There exists a close relationship between soil permeability, spacing and depth of drains. The capacity of water that drainage pipes can carry depends on the pipe's inside diameter, the slope at which it will be installed and the material the pipes are made of. The installation method is just as important for a successful system. Therefore, we strongly recommend to include consultations with drainage professionals in the design phase of the proposed pitch. Synthetic grass may be installed on a well engineered asphalt base, unbounded base (compacted aggregates) or concrete. A compacted aggregate foundation is finished off with asphalt which result in the most durable and stable base to date. The synthetic grass is then installed over the asphalt wearing course. Some sport regulations requires the installation of shock pads to provide shock absorbency. The shock pad will be installed over the asphalt wearing course followed by the installation of the synthetic turf. Most asphalt bases are non water permeable. The base foundation consists of compacted course and fine aggregates. A shock pad, if required, are then installed over the compacted base. If a shock pad is not required, we recommend installation of a geo synthetic material between the base aggregates and artificial turf. The benefit of an unbounded base is that it is water permeable, less costly than an asphalt base but it is not as durable than asphalt and might need replacement or repairs within a few years. Smaller size sport pitches can be constructed by means of reinforced concrete slabs minimum 150mm thickness. The synthetic grass is then installed on top of the concrete surface. One very important thing to remember, NEVER install synthetic playground grass on a concrete slap, cement or paving. It completely defeat its purpose. Make sure your synthetic grass is installed on a well designed drainage base system. especially when the playgrounds are provided with ‘challenging’ playing equipment like jungle gyms, slides, swings, etc. Natural grass won’t survive in these heavy traffic circumstances. 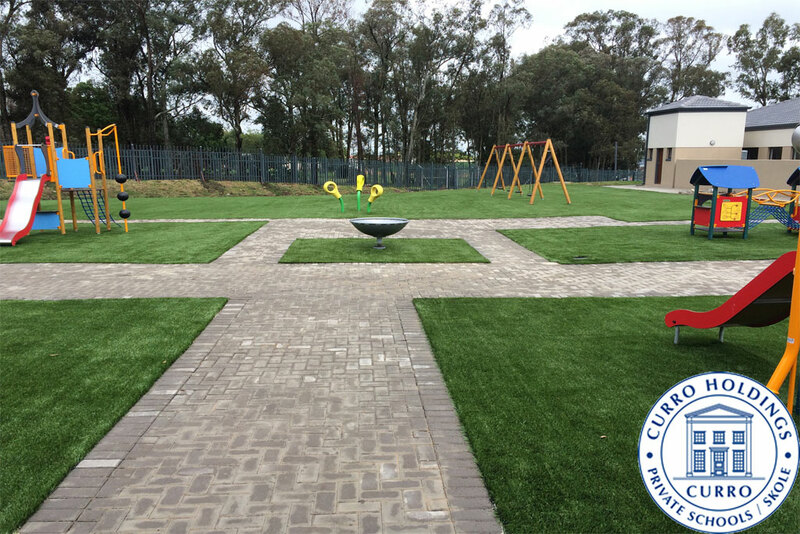 Besides being able to withstand intensive use and its long life span, another advantage of artificial grass for playgrounds is that children also stay reasonably clean when they play on it. They can have fun rolling and crawling around without getting mud or grass stains. 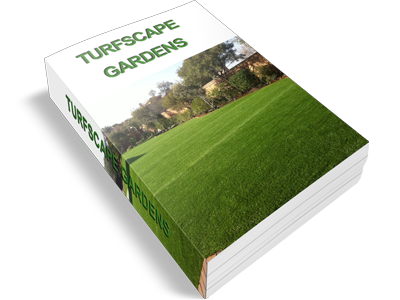 Turfscape offers 4 excellent synthetic grass types as alternatives here. Syn40 is our soccer/football grass and is the primary choice for playgrounds. The 40/50/60 refers to the length of the fibers. The grass is in filled with a layer of clean washed silica sand and layer of rubber granules. The sand acts as a protection and add weight to the grass, while the rubber granules provide the shock absorbency effect to the synthetic grass. 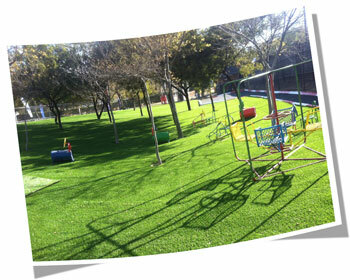 The grass is specially made to have a slide effect, thus no grass burn will occur if a child falls and slide on the grass. A proper playground surface is one of the most important factors in reducing injuries - and the severity of injuries - that occur when kids fall from climbing equipment. The Syn40/50/60 grass are the better choices as it provides more cushioning than the non in fill grasses under the playing equipment (jungle gyms). Its recommended to have a Syn50/60 installed directly underneath the equipment, and the outer areas can be covered with Syn40. **PLEASE TAKE NOTE THAT ADDITIONAL SHOCK PADS MIGHT STILL BE NEEDED TO COMPLY TO THE CRITICAL FALL HEIGHT SAFETY REGULATIONS. COMPLIANCE TO THE SAFETY REGULATIONS UNDER JUNGLE GYMS ARE THE RESPONSIBILITY OF THE CLIENT AND MUST BE REQUESTED SPECIFICALLY IF NEEDED. 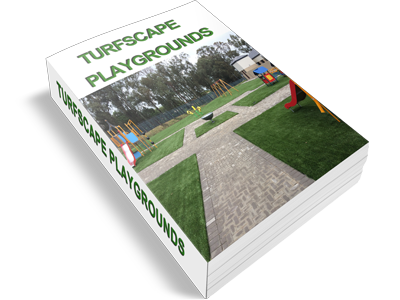 Our Synscape Lux/Prestige synthetic grass is primarily used for gardens, but is an alternative for playgrounds. Its fibers are long, have a curly double stitched yarn that act as the infill. Because of the curly infill yarn, it does not require sand and rubber infill material. The grass is very soft to touch, and really feels and look very natural like real kikuyu grass. a concrete base for playgrounds. **REFER TO THE NOTE RE SHOCK PAD REQUIREMENT AT THE ABOVE FT40/50/60 OPTION. How do I maintain my Synthetic Lawn? •	Washing. Remove leaves, weeds and other debris immediately by means of a blower. It is important to keep artificial grass clean at all times. Plain water from hose to rinse your grass on a regular bases, if it is not raining, is perfect. • Brushing. Synthetic grass fibers tend to lay flat after usage. Periodically brushing the fibers with a hard bristle broom will remedy this. 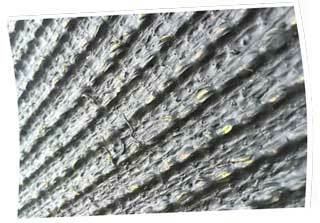 Brushing should be done against the grain of the fibers. • Blowing. Keep the artificial turf clean using a normal leaf blower or brush. If you did invest in a large area of artificial lawn, it's worth investing in a brush machine. If your synthetic lawn is the "infill type" (sand and/or rubber), and you do use a blower, do not blow directly into the synthetic lawn fibers as all the infill will blow away. Blow with an angle on the artificial grass. • Weed control. By keeping the artificial lawn clean will prevent weed growth between the fibers. Weeds can be easily removed by plucking, brushing or raking the grass. Make sure weeds are removed before they can take root, especially along the edges of the turf. A number of environmentally friendly products can be purchased at home improvement centers and garden centers that kill algae, moss and weeds directly. If the instructions are followed carefully, the artificial lawn will not suffer any damage. • Chemicals. Do not use any chemicals directly on your artificial grass. Household dishwashing liquid can be used if needed. Rarely should it be necessary to make use of soap, as water will be more than adequate to clean your synthetic lawn. Damages to artificial grass can be repaired. The damaged piece of artificial turf is cut out and replaced by a new piece. 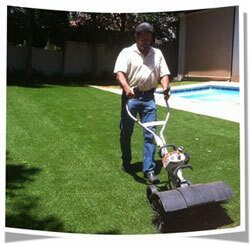 It is therefore advisable to save any remnants of your synthetic grass left over after the installation. These can be used for any repairs. Just be aware of the fact that used artificial grass will look differently than new grass, even when it is the same product. A repair usually remains visible for a while. Over time, this difference in color will be less and less visible. Syn 40 is our football artificial grass. 40 refers to the fiber's overall lenght in mm. A 50mm and 60mm is also available. with the 50/60mm directly underneath the jungle gyms for extra protection and critical fall height. making this grass ideal for playgrounds, soft and very durable. 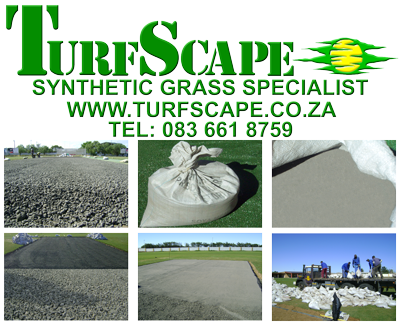 An addisional R40.00 to R60.00 per m² must be added to the Synthetic Grass price for the infill material. Roles are 4m wide and the grass is priced per m² and is sold per linear meter. 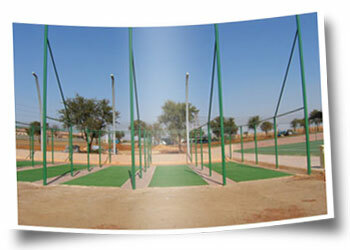 The Oval and SynCricket grass is specificaly designed for artificial cricket pitches. The Oval & SynCricket is a more superior pitch cover that the fiber grass. The main advantages of Oval and Syn Cricket is the control of the speed the ball comming on to the bad, and it offers more grip for spin bowling. The grass is infilled with silica sand (brushed into the fibers) to protect the fibers and grass from excessive wear and tear, also act as the stimp speed controlling agent. Sand required is 4-6Kg/m². The color of is described as a Olive green. Roles are 2m and 4m wide and the grass is priced per m² and is sold per linear meter. 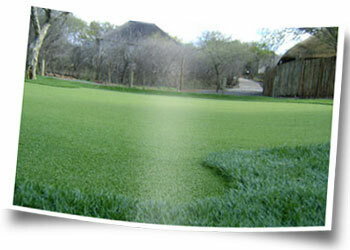 The Pro-Putt artificial grass is another very popular product that is becoming the choice by most golfers. 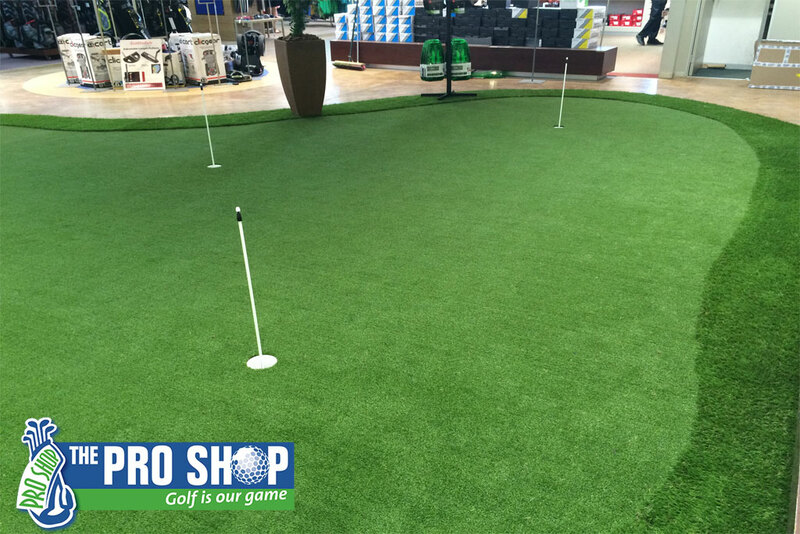 Most of the Pro Shop's putting greens were done by us, using the Pro-Putt artificial grass. A huge advantage of the Pro-Putt is the fact that its stimp speed can be varied from 7 to 10. This is done by brushing in a very fine washed sillica sand between the fibers for optimum speed. Our Synscape grass is a stunning choice for fringes along your putting green. The color of is described as a Fig green. putting green, try to utilize most of the area. 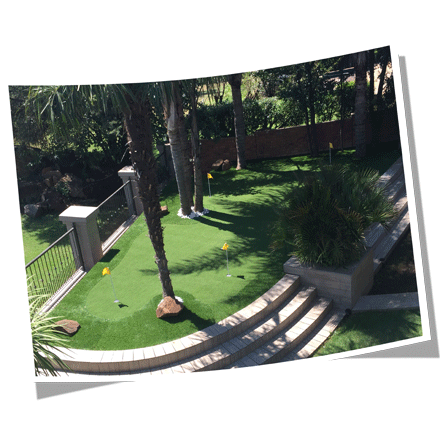 Our Synscape Range synthetic grass is the perfect option for fringes around your putting green. 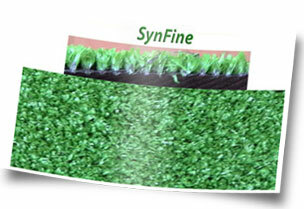 The Synfine is a very light duty artificial grass that is not suitable for permanent outside installations. The pile height of the Synfine is 10mm. or exhibitionists for display purposes. making it ideal for these purposes and transporting it.. The color of is described as a lush green. Roles are 2m wide and the grass is priced per m² and is sold per linear meter. Seeds are very small and great care must be taken during its establishment. Seeds need to be buried in a suitable growing medium, and if buried too deep, the young seedlings will exhaust the energy reserve from the original seed before producing their own photosynthetic energy. There is also a risk of the seeds been planted in air pockets, not having direct contact with the growing medium and therefore unable to absorb moisture. This result in the seeds drying out and therefore not able to germinate. It may take between 6 – 12 months for a 100% grass coverage. Plugs of kikuyu are grown in trays (200 plugs per tray). These plugs are then planted into a prepared soil bed and less vulnerable than seed planting. If the plugs are spaced at 30mm intervals, it may take between 4 – 6 months for a 100% coverage. Grass sods are cut from a previously prepared area and laid over the prepared area after soil preparation. Grass roots establish within 3 – 4 weeks. The grass usually also needs to be thinned out soon after establishment to prevent thatching and to open the grass to let sunlight into the soil surface. Although it provides 100% immediate coverage, it is the most expensive and very costly option. We supply and install instant Kikuyu, LM lawn and kikuyu plugs. The grass is a very good quality and organically fertilized. The farm is situated in Pretoria and orders can either be collected or delivered. The sand acts as a protection for the grass and keep the fibers upright, while the rubber granules provide the shock absorbency effect to the synthetic grass. You want a playground surface where parents can put their minds at ease about letting your children play on the climbing equipment. The Syn40/50/60 grass should be used if the playing equipment (jungle gyms) are very high like the types build with wooden poles. Its recommended to have a Syn50/60 installed directly underneath the equipment, and the outer areas can be covered with Syn40. After a rain shower, artificial grass also quickly dries up again. 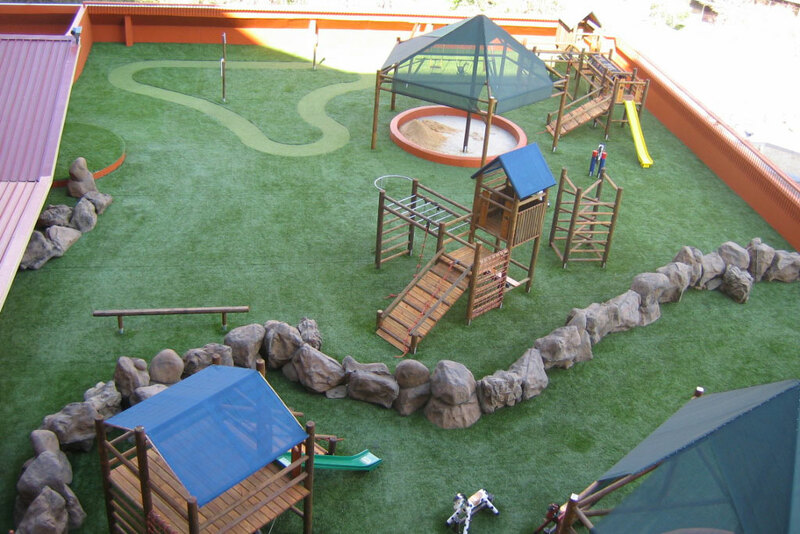 Our Synscape Lux synthetic grass is primarily used for gardens, but is an excellent choice when your jungle gym equipment is of the painted pole type. Its fibers is long, have a curly double stitched yarn that act as the infill.